A photo of student helper SM adjusting the position of a junior student in a recent youth American Karate-Do class. 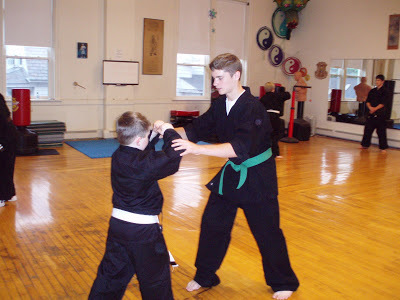 Having senior students assisting with the junior students is the tradition in Martial Arts. It models correct attitude and behavior and helps the junior student to set the ‘standard’ for their art and their life. The junior student gives the senior the opportunity to look at the material from an entirely different perspective!